New Rosenberg Grand Jury Testimony Released! Read the Greenglass transcript here (46 page PDF). 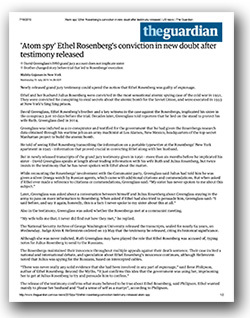 Updated - July 15, 2015, 1 p.m.
Second Supplemental Declaration of Bruce Craig, Ph.D.
Washington, D.C., July 15, 2015 - The newly released grand jury testimony by Ethel Rosenberg's brother David Greenglass suggests he committed perjury on the witness stand in the Rosenberg spy trial, according to experts who analyzed the documents released today and posted by the National Security Archive. The grand jury testimony from August 1950 shows Greenglass resisting prosecutors' questions implicating his sister, in one case (page 30) insisting: "I said before, and say it again, honestly, this is a fact: I never spoke to my sister about this at all." 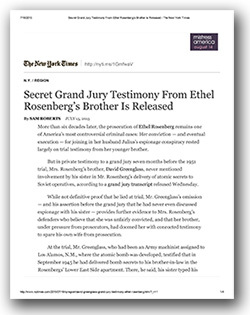 But at trial in March 1951, Greenglass and his wife Ruth put Ethel at the center of the conspiracy, typing up handwritten notes for delivery to the Soviets and operating a microfilm camera hidden in a console table - neither of which is mentioned in the grand jury statements. Decades later, after Greenglass served nearly 10 years in prison and his wife was not even indicted, Greenglass admitted to journalist Sam Roberts that he had lied on the stand to protect his wife, whom the grand jury testimony shows was far more central to the spying than was Ethel. Experts participating in a briefing today at the National Security Archive decried the prosecutors' behavior as either having suborned false testimony, or presenting testimony they had reason to know was false. Attorney David Vladeck, who led the litigation to open the Rosenberg grand jury records on behalf of petitioners including the National Security Archive and the major historical associations, pointed out that prosecutors intended to use Ethel to put pressure on Julius to confess, but neither did so and thus "called the Justice Department's bluff" in a miscarriage of justice. Legal scholar Brad Snyder described the mistake of the U.S. Supreme Court in not accepting cert in the Rosenberg case in 1953, thus enabling their execution, when the contrast between grand jury testimony and trial testimony showed "reversible error." 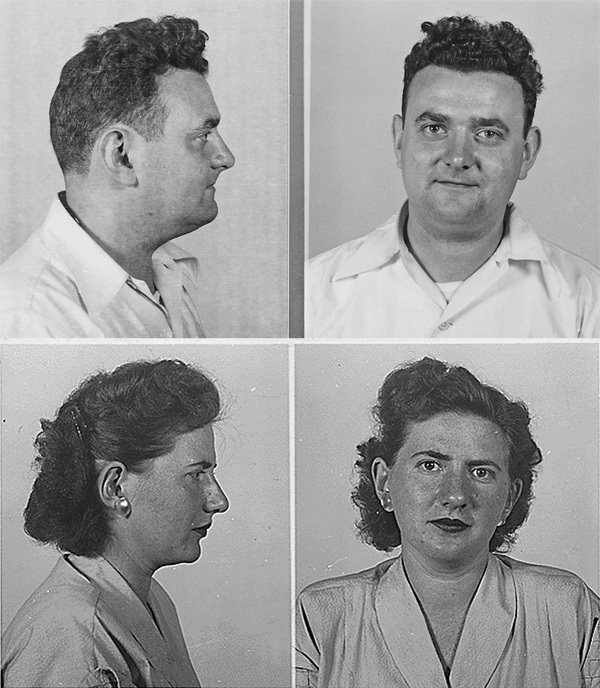 Author Steve Usdin, whose book Engineering Communism (Yale University Press) describes two of the Rosenberg spy ring's members who went on to build the Soviet Union's Silicon Valley, commented that the Greenglass testimony was "the last important evidence we're likely ever to have on the Rosenberg case." 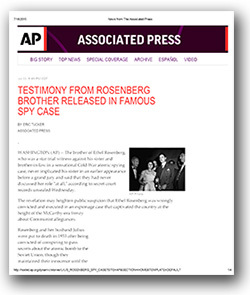 Usdin pointed out that the documents provided answers to three key questions: Were the Rosenbergs guilty of spying? Yes. Was their trial fair? Probably not. Did they deserve the death penalty? No. Archive director Tom Blanton summed up the discussion by describing the Cold War narrative of the Rosenberg case as a black-and-white argument - supporters said they were framed, critics called them traitors. The evidence now shows both were right - a much more nuanced and difficult story. 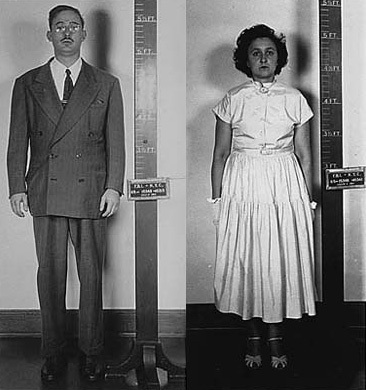 Yes, Julius Rosenberg led an active spy ring; no, Ethel Rosenberg was not an active spy, even though witting. Blanton commented that the case should be a warning about the perils of unchecked prosecutors' power. 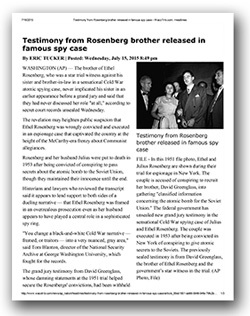 Washington D.C., July 14, 2015 – Tomorrow the public will see for the first time the actual transcripts of previously secret grand jury testimony by Ethel Rosenberg’s brother, David Greenglass, in the espionage trial from the early 1950s that sent Ethel and Julius Rosenberg to the electric chair on charges of spying for the Soviet Union. To explain the documents and provide context, the National Security Archive will host a press briefing at 2 p.m. on Wednesday, July 15, at Gelman Library, George Washington University, 7th floor (where the Archive is located), 2130 H Street NW, Washington D.C. 20037. The U.S. government has decided not to appeal the federal court decision on May 19, 2015 ordering the release of the Greenglass testimony, in a lawsuit brought by the National Security Archive and major historical and archival associations. 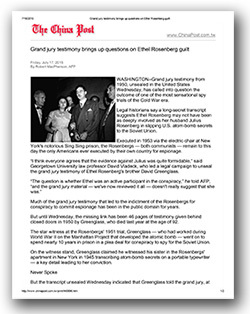 Previously in 2008, the petitioners succeeded in winning release of most of the other Rosenberg grand jury testimony, but Greenglass – who was still alive at the time – objected and the court declined to include his transcripts. Greenglass passed away in 2014 and the plaintiffs re-opened the case before Judge Alvin Hellerstein in federal district court in New York. The transcripts will show whether Greenglass mentioned to the grand jury what became his most incendiary charge at trial against his sister, that she had typed up his handwritten notes for delivery to the Soviets. Historians have now concluded that he lied on the witness stand. Copies of the transcripts will be available on the Archive’s web site, www.nsarchive.org, and at the press briefing at 2 p.m. The government has announced that the National Archives and Records Administration will also post the transcripts starting at noon on July 15 at www.nara.gov. Together with the Archive, the petitioners included the American Historical Association, the American Society of Legal History, the Organization of American Historians, the Society of American Archivists, and journalist Sam Roberts who authored a biography of Greenglass. Representing the petitioners are Georgetown University Law Center professor David C. Vladeck and Debra L. Raskin of the New York firm Vladeck, Waldman, Elias & Engelhard, who also authored the original 2008 petitions that opened the previous Rosenberg grand jury records. Participating in the briefing will be Rosenberg case experts Brad Snyder and Steve Usdin, together with Archive director Tom Blanton and the petititioners’ lead attorney David Vladeck.